I had to leave the room – standing in the back of the space where CCO campus ministry staff was worshipping together, I felt tears well up. Granted the band was very cool, the acoustic guitars and mandolin doing first an old hymn and then a slow, groovy version of “Did You Feel the Mountains Tremble?” with the soulful backup singing by two dear friends creating a reverent and passionate experience of singing before God. But it wasn’t just the tone and artful excellence of the song-leading the touched me so; it was how CCO cross cultural director Michael Chen (an accomplished acoustic guitar player and cellist) read Colossians 1: 15 – 19 while the groove continued. 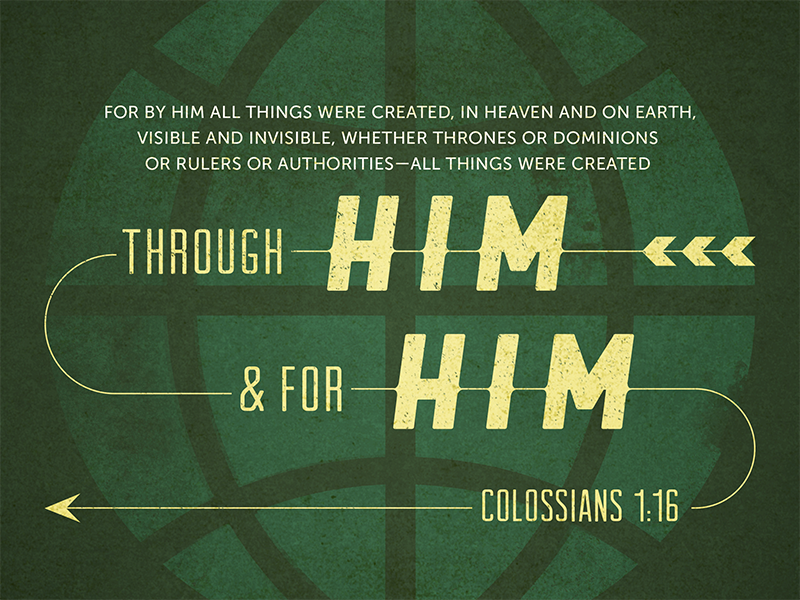 Being reminded of this first century worship song – Colossians 1 most likely was used liturgically in the early church – about Christ’s Lordship over all of life is always moving for me. “In Him all things hold together.” Christ is to have “first place in everything.” He is “redeeming all things.” Indeed, the charter for our bookstore work – encouraging the spiritual discipline of reading widely to learn about all things, to deepen curiosity and wonderment, to develop a sense of what is to be done in so many spheres of life and culture – comes from this very passage. Just a few days before I was re-reading parts of one of my favorite books – Colossians Remixed: Subverting the Empire by Brian Walsh & Sylvia Keesmaat (IVP) again pondering the meaning and implications of this passage so many of us so value. I hope you know that book; it will rock your world, I guarantee it. Hearing Michael read the Colossians passage so well, with the guitar overlay, was just so simple and good and moving. (Oh if only the Bible was read well in our Sunday liturgies and mid-week songfests.) But that wasn’t what caused me to become undone. As the band continued their riffs, six or seven CCO staff quietly made their way to the front and prayed beautifully for various careers areas and academic disciplines found at the universities where they minister. They prayed for business majors and those working in the marketplace, they prayed for sport and athletics, for those in trade schools and in blue-collar occupations, and for those preparing for careers in the arts and other creative endeavors; they prayed for scientists and students working in labs, math, engineering and they prayed for those in medicine and health care professions. In each field, prayers were offered thanking God for the goodness of the gifts in those areas and then laments were voiced about how broken and dysfunctional some aspects of those fields are. And we beseeched God for students to become salt and light in these disciplines, deepening their sense of vocation and prophetic imagination, knowing that God would use them to bringing God’s own renewal and health to our world. Who prays for workers, career by career? Who prays for college students to do their studies in a manner that is consistent with a Christian worldview? How does our worship form/train us to think about these things, learning to long for the Kingdom coming, in every square inch of God’s good but fallen world? Do we see redemption as a restoration of creation – all careers and callings, every zone and sphere of society renewed to its rightful praise of God – and even if we do, do we sing hymns and pray prayers that are consistent with this big hope about the broad scope of redemption? Does our worship help us live into the reality that “the Earth is the Lord’s and the fullness thereof?” Do we pray as if we believe Colossians 1? So I cried out of sheer joy; if you have walked with God for very long I am sure you have “had a moment” in the Spirit and know what I’m talking about. And I was very aware that this kind of liturgical moment is all too rare. Why have I sat through literally thousands and thousands of worship services and only heard such prayers on the rarest of occasions? In the moments following this opening worship time I made some book announcements and then did some one-on-one hand-selling of relevant titles for these good folks in their on-campus friendship-building, evangelistic outreach, disciple-making, and spiritual formation. We had thousands of titles there, but I thought I’d just name a bunch of books that I featured, talked about, showed off or tried to sell at that CCO staff training gig. Of course I’m only mentioning a few that we presented, set up (and lugged home unsold.) But these, at least, were discussed, for sure. For BookNotes readers, we will offer them at an extra discount, too – 20% off that are mentioned. We list the regular retail price, but will gladly deduct the discount when you order from us. Enjoy. 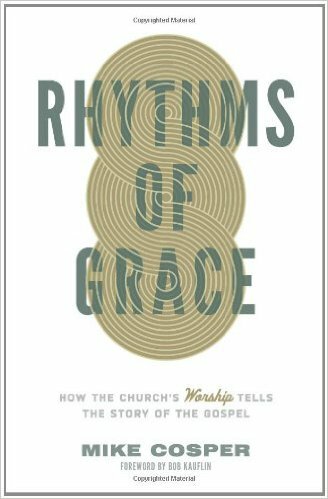 Rhythms of Grace: How the Church’s Worship Tells the Story of the Gospel Mike Cosper (Crossway) $15.99 I shared this right away with CCO folks after our moving worship moments and those vocationally-oriented prayers. Actually, I’ve been telling folks about this a lot lately, as it not only reminds us of the importance of worship and what congregational worship is all about, but it explores how the narrative of the Biblical story should inform our worship, and how gospel-centered worship recounts the truest truths, week by week. A great little book. 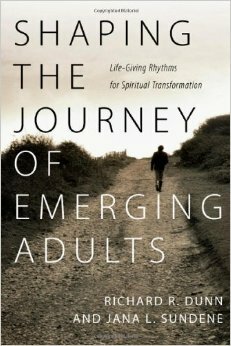 Shaping the Journey of Emerging Adults: Life-Giving Rhythms for Spiritual Transformation Richard Dunn & Jana Sundene (IVP) $18.00 At the Wee Kirk small church conference at which we worked a week before the CCO seminar (which we told you about in a recent post) we were delighted to hear this book recommended to local church folk who want to understand young adult ministry. Naturally folks know the analysis offering in the very popular You Lost Me: Why Young Adults Are Leaving the Faith… and Rethinking Faith by our friend David Kinnaman (available in book and/or DVD curriculum.) But this one is really rich, beautifully written, about how to do work with this particular population. I take Shaping the Journey of Emerging Adults to CCO always, as it is one of a handful of must-reads in this field. 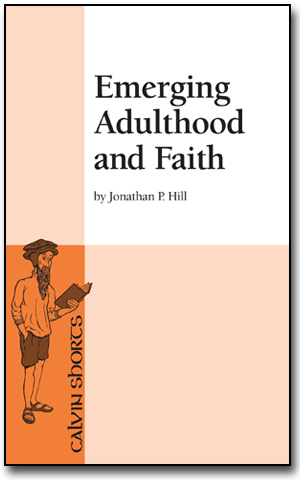 CCO staff also often get Spiritual Formation in Emerging Adulthood: A Practical Theology for College and Young Adult Ministry by David Setran & Chris Kiesling (Baker Academic; $24.99) which is also a major contribution to young adult ministry. 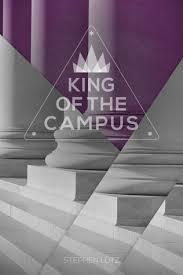 King of the Campus Stephen Lutz (House Studio) $14.99 This book by Steve Lutz is one any student interested in growing in her or his faith could start with, a book full of good Christian thinking about all of life, basic discipleship, church involvement, how to be involved in campus activities with a missional mindset, discernment tools for thinking about calling and vocation, and more. I have a blurb on the back saying how good it is, and I stand by that: no other book for college students covers so much good stuff, including good citations from Melleby and Opitz. Steve works for a church with a rich campus ministry in State College, (yes home of the blue and white Nittany Lions.) You should give this book to somebody you know who is off at college. Midnight Jesus: Where Struggle, Faith and Grace Collide Jamie Blaine (Thomas Nelson) $15.99 I love sharing memoirs with groups – almost anywhere we go to sell books we note that reading memoirs is not only fun, but a good way to understand others, to realize how people narrate their lives and how we, too, can make sense of things by telling the story of our days. Anyway, one I featured this time is spectacularly well written, vibrant and wild and fascinating and moving. This author is a late night counselor, has served to help those on the fringes of culture, the hurting, their weird, the broken, and he tells their stories with dignity and grace. It is one of those books about which you can energetically shout “You will laugh. You will cry.” And you will never forget it. 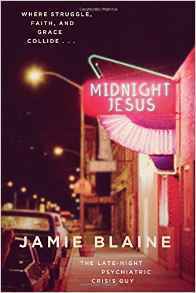 Midnight Jesus shares fascinating, bizarre, and sometimes humorous true-life stories of everyday people looking for hope in their darkest hours. Poignant and unpretentious, Jamie paints beauty where at times it seems none exists–from skating rinks and bars, late-night highways and lonely apartments, broken churches and rundown trailer parks, jail cells, bridge rails, ERs, psych wards, and that place over the levee where God laughs and walks through the cool dark night. The rave endorsements are from everyone from August Burroughs (Running With Scissors) to River Jordan (Praying for Strangers) and a whole host of others, including a number of rock and rollers and alt journalists. are amazingly strong. One book review says he writes like “a born again Nick Hornby or Chuck Klosterman” while another said he is “somewhere between Bukowski and Billy Graham” which I suspect has never been said about any other writer, ever. From off-center rockers to folks seriously plagued by mental illness to those who are just seething and crazed or down and out, Jamie Blaine — “the late night psychiatric crisis guy” — tells their story, and brings grace and goodness into the mix. I ran out of time in my book announcement, but if I could have, I’d have read some of this right out loud, and you’d know I’m not kidding about this one. Whew. 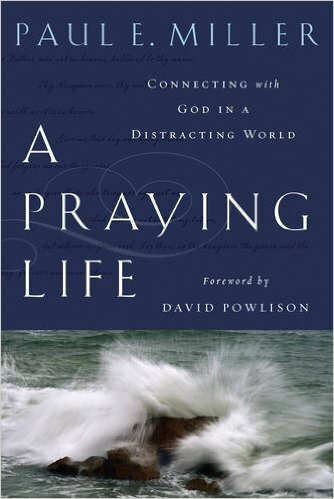 A Praying Life: Connecting with God in a Distracting World Paul Miller (NavPress) $14.99 We love having a book that routinely sells, and that we always hear great comments about. People walk by our book display and, noting A Praying Life say “Oh, that is one of the best books I’ve ever read,” or “my friend told me I had to read that” or “Our church studied that one and it was fantastic.” This book has a remarkable buzz, and it is well deserved. One of the best books on prayer I’ve ever read. By the way, check out his one on Jesus called Love Walked Among Us, too. Or a newer one on the Biblical book of Ruth called A Loving Life — In a World of Broken Relationships. Thanks to NavPress for doing this great title! A Beautiful Disaster: Finding Hope in the Midst of Brokenness Marlena Graves(Brazos) $15.99 I have promoted this fabulous book among CCO staff before, and it is ideal for those who want to investigate the life-giving ways of classic spiritual disciplines, written with a bit of candid memoir (the author is a good storyteller, who shares about growing up rural and poor with an evolving childhood faith) and how coming to know and experience God’s presence in the wilderness of her painful life gave her courage to keep on and thrive. This well written book (with a great foreword by John Ortberg & Laura Ortberg Turner) includes lovely, insightful Bible study, a good narrative structure, and helpful teaching about spiritual formation. It’s a good read, and a great resource. The title alone is worth pondering, eh? 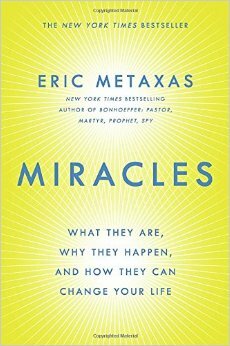 Miracles: What They Are, Why They Happen, and How They Can Change Your Life Eric Metaxas (Dutton) $16.00 I raved about this (as did many whose writings we respect) when it first came out in hardback, and those who have read it have used superlatives in trying to express the grandness of this report. As always, Mr. Metaxas brings a brainy but winsome style to his well-crafted prose; the important Kirkus Reviews said it was “erudite and intimate.” Miracles is truly fascinating, including excellent storytelling, wise rumination, honest evaluation, deep mystery, and a sense of wonder about the way God seems to work in the world. Excellent for anyone, but really good for those who are skeptical of the notion of the supernatural or whose progressive faith doesn’t want to seem anti-intellectual or overly charismatic. This is a great book, now in paperback. For what it is worth, we also sold, there, a couple other Metaxas titles such as Bonhoeffer (of course), Seven Men (now in paperback – I think the guy who bought it was going to try to read it with a frat brother) and Seven Women, as well as an older one called Everything You Always Wanted to Ask About God (But Were Afraid to Ask.) We routinely show off his great compilation of “Socrates in the City” lectures called Life, God, and Other Small Topics. I tell some browsers just to read the introduction, which will make them laugh, and the table of contents, which shows the stellar cast of folks involved. 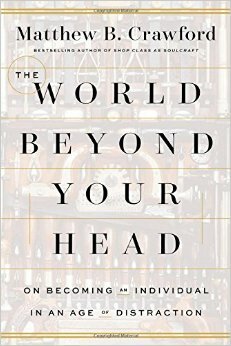 Makes a great gift for a faculty member, too, or any brainy type who enjoys good anthologies of thoughtful talks. 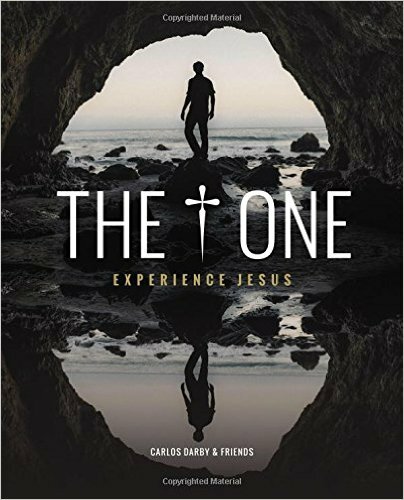 The One: Experience Jesus Carlos Darby, Judah Smith, and others (Thomas Nelson) $14.99 This is one I held up and tried to promote, although one actually has to hold it and study it a bit to really appreciate it. 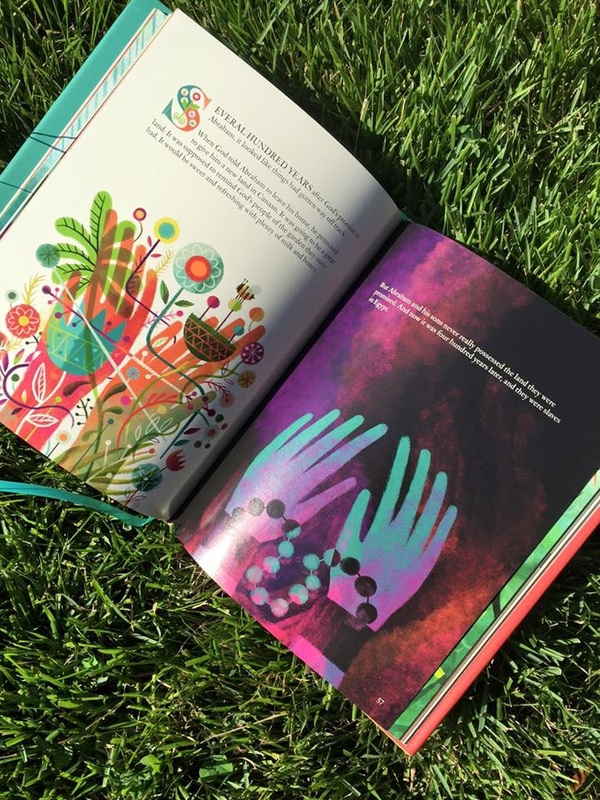 This is designed for a visual generation, a slightly over-sized paperback – almost like a very thick magazine – with moody and cool photographs illustrating the stories told about people finding new life in Jesus. It walks through stages of faith, I suppose, and each testimony is enhanced with these excellent, beautiful, striking photography pieces. The pictures shown are not real shots of the writers, actually, and if there is any fault in this creative project it is that the models in the pictures are a bit tooo hip. But for the audience (artful and design-savvy young adults, the instagram generation) it really works. It would be a good book to share with somebody who doesn’t read conventional religious texts and who you’d like to invite into an live encounter with Jesus. 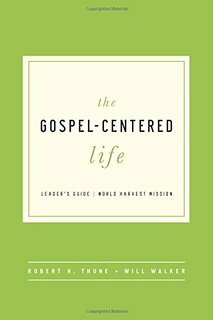 Gospel-Centered Life Participants Guide and Leader’s Guide (New Growth Press) $11.99 and $14.99 We always have a big stack of these for CCO staff, many of whom buy a bundle each season to use with small groups on campus or at church. These are serious, intense, grace-based reminders of Christ’s finished work, how the atonement transforms us, and how the gospel is such very good news for sinners like us. It helps small groups really grapple with the transforming “inside out” impact of the core truths of the gospel — God’s holiness, our need for rescue, the sufficiency of the cross, free grace, true liberation for idols and fears. The sequel, Gospel Centered Community is popular, too. It’s Not What You Think: Why Christianity Is About So Much More Than Going to Heaven Jefferson Bethke (Thomas Nelson) $17.99 I wonder if you know the video that went viral a few years ago Jesus > Religion by Jefferson Bethke. The book that followed that, with the same title, is really good (better then I surmised it would be) and young adults all over know it. If something is going to be so popular, I’m glad it is rich and thoughtful and solid. This brand new one was one of the best sellers at this two day CCO gathering, and we’re glad for the buzz on it. Bavinck on the Christian Life: Following Jesus in Faithful Service John Bolt (Crossway) $19.99 We displayed faced out this whole set of books, the “Theologians on the Christian Life” series, all of which are said to be very, very good. The Bonhoeffer one by Steve Nichols is just spectacular, I think, exceptionally useful, and illustrates nicely what is so good about this whole series – taking the life and central teachings of these historic church leaders/theologians and showing how they can enhance our own spiritual lives today. I figured since some of the CCO’s influence includes the Dutch Kuyperian neo-Calvinist worldview tradition, they’d snap up this new one about Kuyper’s esteemed colleague from the late 1800s. Let’s just say I still have some of these left, so maybe some of our mail order customers might want to order them. 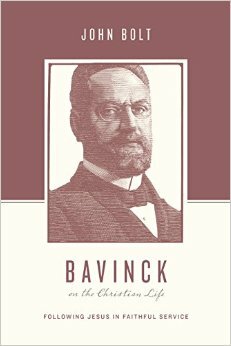 It really is great, a book many of us have been wishing for, relating Bavinck’s life and work to today. See the whole set described here. 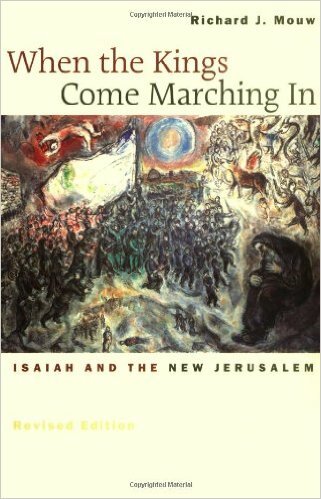 When the Kings Come Marching In: Isaiah and the New Jerusalem Richard Mouw (Eerdmans) $15.00 I take this most places we go, whenever appropriate, as it is a splendid little study on how the read the Bible well, using as a case study the way in which an eschatological passage in Isaiah can be understood by a careful reading of Revelation 21 and 22. Does God really intend to redeem all of life and culture? Does ordinary stuff matter -sports, music, justice, family? How can we live into this vision of God bringing redemption and hope to the whole groaning creation? A great little book, jam packed with implications for daily life, by an author we so respect and appreciate! New Heaven New Earth N.T. Wright (Grove) $10.99 Speaking of great little books about the restoration of creation, the full picture of Biblical hope, the promise of redemption defined as a (re)new (ed) earth, this booklet is imported from England, and we think it is a great tool to enhance Bible knowledge and Christian living. There is nothing in print like it that is simple and clear and inexpensive. 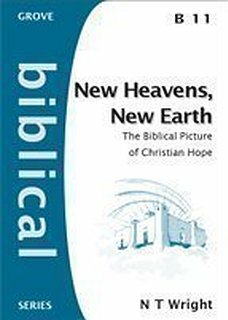 I pressed it upon the CCO folks who know that most undergrads aren’t going to wade through J. Richard Middleton’s New Heaven and New Earth or Tom Wright’s Surprised by Hope. You should order a bundle from us. Although you should consider that Middleton book if you haven’t yet gotten it. Subversive Christianity: Imaging God in a Dangerous Time 2nd edition Brian Walsh (Wipf & Stock) $15.00 I mentioned Walsh’s Colossians Remixed above in my intro, but at CCO I also showed off this recently reprinted small collection of powerful talks given by Brian in the years after his groundbreaking, now classic Transforming Vision (co-written with Richard Middleton.) Transforming Vision was a seminal and generative book within CCO decades ago, and we still commend it, wishing more people could get caught up in its social analysis and expose of dualism and idolatry within our deformed society. I’m glad for Subversive, though, and it is a poignant, thought-producing little collection, with Biblical exposition and cultural criticism and poetic preaching. One of the challenging chapters in Subversive Christianity was first delivered at a old CCO Jubilee conference and is still as timely as ever. A good endorsing foreword by N.T. Wright, too. Woot. 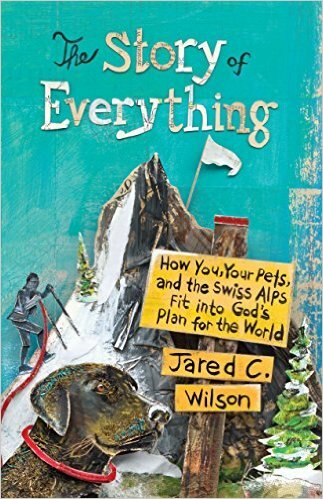 The Story of Everything: How You, Your Pets, and the Swiss Alps Fit into God’s Plan for the World Jared C. Wilson (Crossway) $15.99 When the writers for the Gospel Coalition and Crossway books — known for conventional Calvinism and a lot of theology books — get this vision of a broad, big, winsome picture of all of life redeemed, it is time to notice, and rejoice. 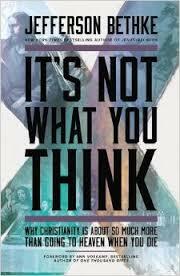 I like Justin Holcomb’s note on the back: “If you need to hear some incredible news, read this book. It will change you.” CCO’s big Jubilee conference has as it’s theme this year “transforming everything.” This is why. God is telling this big story of creation being rescued and how everything matters. Are you listening? Nice! 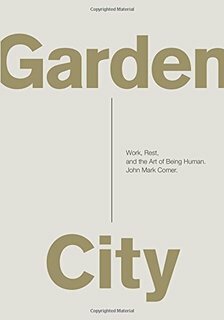 Garden City: Work, Rest, and the Art of Being Human John Mark Comer (Zondervan) $20.99 I raved about this cool-looking, very easy to read hardback last week, and did so again with our friends at the CCO event. It is perfect for today’s young Christians, those eager to relate faith and life, but who don’t have the vocabulary or theology or Biblical knowledge to see how being fully human, caring about work, culture, is explained in the Scriptures, and therefore can’t get a good handle on the claim that all of life is spiritual, let alone how it really plays out. As I’ve mentioned this new book is hip and fun and even a bit funny and solid and good, refreshing and exciting. Maybe it should be considered the best introduction — that younger readers will actually gladly read and finish — about vocation, calling, work, rest, and God’s big Kingdom. He knows well the academic literature (J. Richard Middleton or N.T. Wright, just for instance.) Garden City is fantastic. Spread the word! 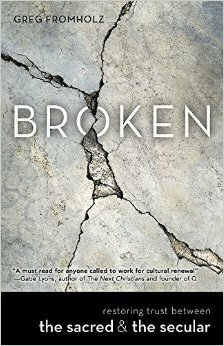 Broken: Restoring Trust Between the Sacred and the Secular Greg Fromholz (Abingdon) $16.99 I was glad to announce this when it first came out and thought CCO folks would appreciate it now. It is creatively written, reflective and energetic, eager to help followers of Jesus get how to more wisely navigate the culture in which we live, thinking faithfully about why God cares about it all, and how to be appreciative of God’s work in the world, even the worlds of culture, film, art, social institutions and media. We’ve created this ungodly disconnect, and this shows us how to reconnect faith and practice in the real world. CCO folks get this already, but are always looking for fresh ways to explain our vision, and get others enthused about an all-of-life redeemed sort of vision. Plus, anything with a vivid endorsement from Gabe Lyon’s is sure to catch their attention. I think it should be widely known, and you just might enjoy it a lot. 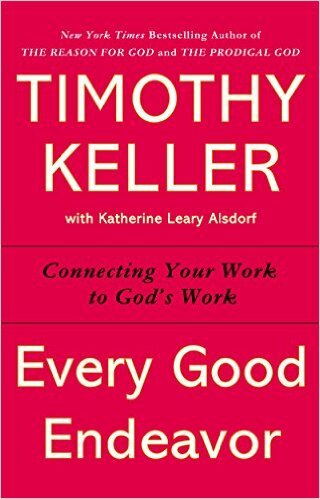 Every Good Endeavor: Connecting Your Work to God’s Work Tim Keller & Katherine Leary Alsdorf (Dutton) $16.00 I’ve already noted how CCO is unique among campus ministries in part because of their passion for whole life-discipleship that includes helping collegiate think about faith and vocation, Christian perspectives in the classroom, and learning to desire practices that help us relate faith and work, careers and callings. We always take to CCO staff training events a large batch of different books on calling and vocation, and then a bunch on work and labor, hoping these campus workers will have this stuff so much in their bones that it will spill over into the lives of the students with whom they are in contact. Their annual Jubilee conference does this so well, but they know that for students to benefit most from that big Pittsburgh gathering, they need some prep work. 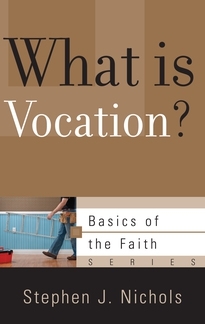 Even a small booklet like What Is Vocation? Steve Nichols (P&R; $4.99) can be life-changing: everything matters to God, including our sense of calling to a career or occupation. I am always glad to hold up Os Guinness’ The Call: Finding and Fulfilling the Central Purpose of Your Life which is still one of my all-time most-recommended books ever. And there’s Parker Palmer’s beautiful Let Your Life Speak, Robert Benson’s The Echo Within and a splendid, brand new guide to help students think about what they want to do someday called Your Vocational Credo by Deborah Koehn Loyd which is a bit more practical and upbeat then the serious, wonderful, wise Courage and Calling: Embracing Your God Given Potential by Gordon Smith. To frame all of this well I always like to recommend A Journey Worth Taking: Finding Your Purpose in This World by Charles Drew. Excellent writing, wise, good, thoughtful. And for those mature in this, wanting an enduring book to live with perhaps for a long time, the exceptional Visions of Vocation: Common Grace for the Common Good. After showing a big stack at CCO I did an announcement about it, inviting the activists at the criminal justice reform conference exploring mass incarceration about it. Garber gets around, and I am committed to helping his book get where he sometimes doesn’t. I know you know how much I value it. The Keller book is one of the very best on work itself, but we have others. For instance, How Then Should We Work? 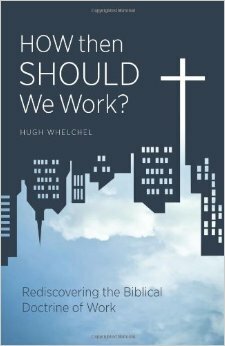 Rediscovering the Biblical Doctrine of Work by Hugh Whelchel is great and clear — no-nonsense, very concise, quotes Kuyper, and offers a fabulous, Biblical foundation. Finding Livelihood by the exquisite writer Nancy Nordenson (published by the always interesting Kalos Press) — as I’ve said in a long BookNotes rumination, here, is reflective and beautifully penned, full of mystery and wonder and pain and power. We had maybe a dozen or so others — Kingdom Calling: Vocational Stewardship for the Common Good by Amy Sherman, Work Matters by Tom Nelson, Work: A Kingdom Perspective on Labor by Ben Witherington and a number of Paul Stevens — at the CCO. We appreciate their effort to make disciples who will think about these things and hope our BookNotes readers will continue to let folks know about our large selection in this faith/work area. For more, see this list, here. The World Beyond Your Head: On Becoming an Individual in an Age of Distraction Matthew Crawford (Random House) $26.00 Speaking of books we sold about work: some in the CCO circles were significantly influenced by hearing Jamie Smith two summers ago, and his Desiring the Kingdom and Imagining the Kingdom remain very important books for our conversations about the nature of effective ministry and how to relate worship, spiritual formation, and all-of-life redeemed work in the world. 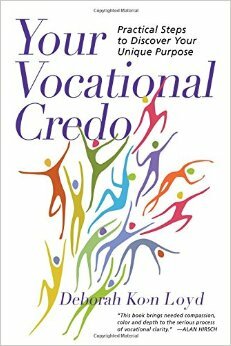 Interestingly, some of the staff that work at vocational and trade schools were talking about how this recent book by Matthew Crawford is consistent with Smith’s own views, and how his first book – Shop Class as Soul Craft: An Inquiry Into the Value of Work is so very important for our thinking about not only work, but learning, discipleship, habit-formation, character and more. Both books are meaty, provocative, wise, and important. We have reviewed them both. I hope you know them. 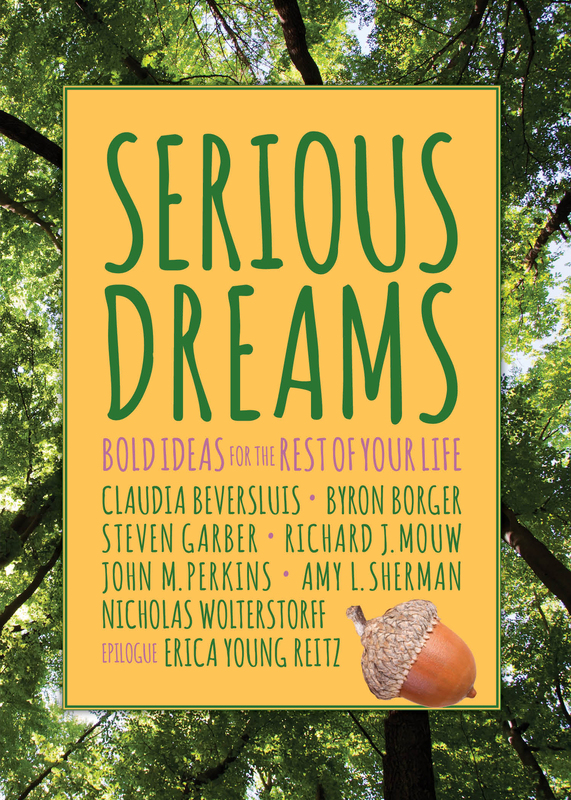 Serious Dreams: Bold Ideas for the Rest of Your Life edited by Byron Borger (Square Halo Books) $12.99 Okay, I didn’t really announce this to CCO since they know all about it (it is dedicated to them, after all.) 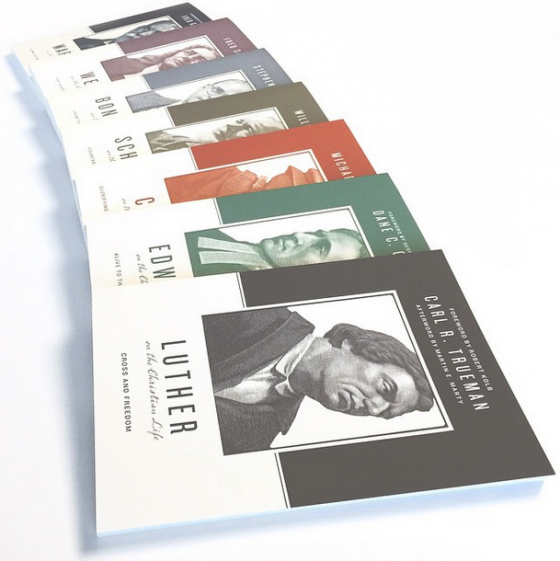 But this collection of graduation speeches by serious Christian leaders who have given such attention to this integration of faith and vocation, thinking faithfully about discipleship and culture, work and the common good, well, it is good for CCO staff to share with their students, even though it was designed as a gift for young adults transitioning out of school. Could it also be good for you, or somebody you know, reflecting together with some of our best thinkers about the impact you can make on the world around you? Sorry to promote my own little book, but the authors are fantastic and their sermons are so good; even the packaging and page design and discussion questions have gotten some nice comments. Read chapters by Richard Mouw, Nicholas Wolterstorff, Amy Sherman, Claudia Beversluis, Steve Garber, John Perkins, me, and an epilogue by CCO staffer Erica Young Reitz. You can read more about it here. 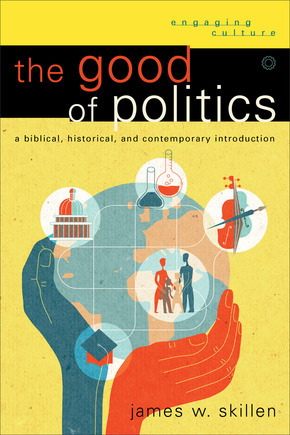 The Good of Politics: A Biblical, Historical and Contemporary Introduction James W. Skillen (Baker Academic) $24.00 Just like any pastor or spiritual director, we who are leaders, and CCO campus ministers, naturally, will be asked in the coming months about our views of the political campaigns, and what we think about regarding our citizenship, the elections, and who to vote for. Getting a solid, historically-informed, Biblically-shaped view of the task of the state and the role of government is essential. I have written about this before (here is one of my most-circulated columns from a few years back) and have commended Jim’s important volume often. 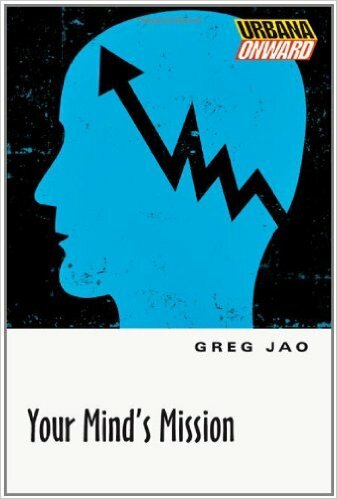 In our CCO circles, this book (he is an old friend of the organization, having done staff training in the past, and has spoken at Jubilee) should be considered a must-read. I reviewed it at length here, explaining why Jim Skillen’s work is valuable for us today. Unleashing Possibility: Why Escaping Poverty Requires a Shared Vision of Justice Michael Gerson, Stephanie Summers, Katie Thompson (Falls City Press) $11.99 What a joy to promote this up front at the CCO staff training time — Steph Summers, now CEO of the Center for Public Justice, worked for CCO for 12 years, and remains loved and very highly respected by all who know her. The publisher — Falls City Press — is founded by a former CCO staffer, too, Keith Martel, who works now in higher education as a professor, while his wife, Kristie, continues to be associated with CCO. (She is the interim director of multi-ethnic ministry at Geneva College, by the way.) So, this book – which I reviewed last week (which you can read HERE) with so many CCO connections, is a delight. I’m really a fan of this little volume, and want to again remind you of its usefulness. I like how slim and concise it is, and how it brings together a bit of urgent data about poverty, great framing and re-framing the topic in light of Biblical themes and theological insights, and lots of great stories of creative service, faith-based ministries doing social advocacy, and inspiring ministries with the poor. Not only is this a great guide to next steps of social outreach and service, but it offers a very helpful way to think about how serious problems like poverty can be partially solved by both energetic volunteerism and specific, if limited, involvement by the government. That is, it draws on the best instincts and strategies of both Republicans and Democrats, and shows how to really solve pressing problems. 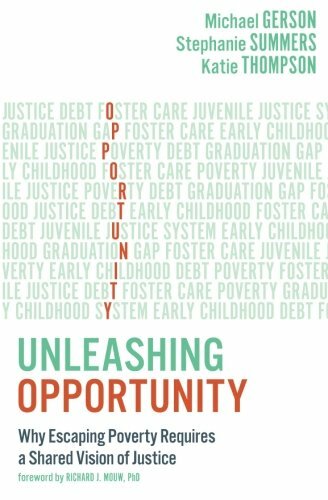 It studies early childhood intervention, foster care issues, juvenile justice, the graduation gap and…. See also Keith Martel’s own co-authored book (with Brian Jensen) entitled Storied Leadership which was the first book to roll out of Falls City Press. Yes!! 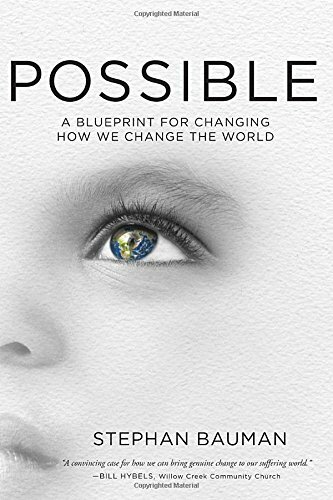 Possible: A Blueprint on How We Think About Changing the World Steven Bauman (Waterbrook) $22.00 We took this very inspiring book to New Orleans to the Christian Legal Society conference a few weeks ago since Steven was speaking there and we wanted others there to appreciate his good writing. We took it to the Wee Kirk conference, thinking that small church leaders needed this kind of winsome oomph and big hope. We took it just the other day to the conference on mass incarceration, and it was one of the first books we sold there in that gathering about fighting racism, advocating for restorative justice, ending the injustice of solitary confinement and other prison reforms. Bauman is the CEO of World Relief and has lived in Africa, so he knows something about how change happens, and the wholistic call of Christ into the world of hurt and need. A very inspiring book. CCO friends, you should know this guy! And so should everybody else. 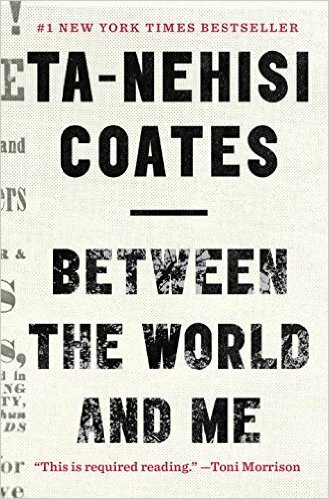 This recent book by Ta-Nehisi Coates — a moving memoir designed as a letter to his son, by turns tender and polemical — has been a much discussed New York Times best seller this year, and anyone involved in the hard work about race simply must know it. (Coates earlier book, The Beautiful Struggle — a coming-of-age memoir set in Baltimore with his brilliant but broken Viet Nam vet father who hung with the Black Panthers — got much acclaim and is by my own bedside now.) We lugged a bunch of Between the World and Me first to the CCO event, and then, of course, to the mass incarceration/prison reform conference, too. 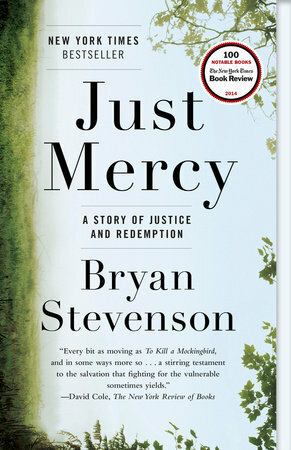 Just Mercy: A Story of Justice and Redemption Bryan Stevenson (Spiegel & Grau)$16.00 Now that this is out in paperback, even more folks are buying it! Although CCO had hosted Bryan at their Jubilee conference years ago, and we sold a number to them a half a year ago when it came out in hardcover, we are glad it is now a nice sized paperback with an affordable price. I hope you know it and own it. I had displayed Bryan’s Just Mercy next to some other books that are particularly passionate about institutional racism and structural adjustments needed as we moved towards what King called “the beloved community.” For instance, if you are serious about this stuff, you should know The New Jim Crow by Michelle Alexander, The Cross and the Lynching Tree by James Cone, Dear White Christians by Jennifer Harvey and Stand Your Ground: Black Bodies and the Justice of God by Baltimore pastor and Black Lives Matter activist, Kelly Brown Douglas. I like that CCO insists on historic orthodox faith and a lively evangelical vision based on standard Biblical teaching, but also commends reading widely, with discernment, in community, wanting to engage the most important work available in this field. We take a variety of books to these CCO gatherings, and we appreciate any groups that are willing to struggle with stuff outside of their own comfort zone. Kudos. 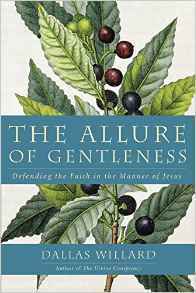 The Allure of Gentleness: Defending the Gospel in the Manner of Jesus Dallas Willard (HarperOne) $26.99 Thoughtful evangelicals as well as many mainline Protestants are increasingly aware of the profound work of the late Dr. Willard. This is thoughtful, lively, and very, very good, as all of his books truly are. Few can bring such deep commitments to spiritual transformation and such intellectual dexterity and write books so helpful to so many. We showed all of his books there, as well as books by his friends John Ortberg, Richard Foster, Eugene Peterson, Ruth Haley Barton and the like, but think this new one if very special, especially for those doing any kind of evangelism or outreach work as does the CCO. 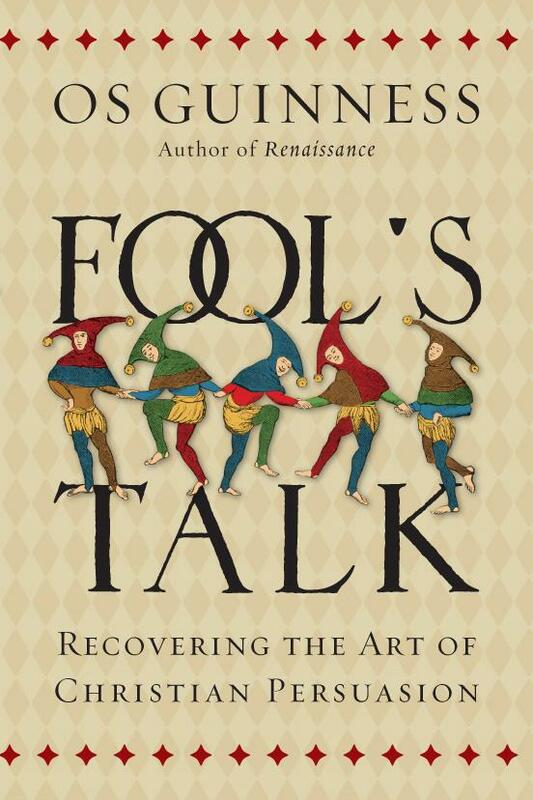 Fools Talk: Recovering the Art of Christian Persuasion Os Guinness (IVP) $22.00 I suppose you can imagine that this would sell well in CCO circles, with their deeper emphasis on worldview formation and their work within very diverse and pluralistic campus cultures. Most twenty-somethings thought are not fully aware of the legacy for which Guinness is known, even though we displayed maybe six of his different books, and this kind of heady book is actually a hard-sell among those new to this kind of mature exploration. I really, really recommend it to anyone interested in evangelism, apologetics, or political action, especially those wishing for a more civil public square. If you care about personal respect or public discourse, start with Richard Mouw’s lovely little Uncommon Decency: Christian Civility in an Uncivil World and then move to this remarkable, serious volume. One of the CCO “areas” is going to read it together as a staff. Hooray! Rainbows for the Fallen World Calvin Seerveld (Toronto Tuppence Press) $30.00 It isn’t every group that has a pair of young adults reading out loud one of the more challenging chapters of this book on aesthetics over lunch. And it isn’t every group where offering his devotionals – the serious set of Bible-based sermons in Take Hold of God and Pull and the powerful short ruminations on art pieces in On Being Human Imaging God in the Modern World–is appreciated. (Thanks to the CCO guy who waved On Being Human around in front of my face to assure me he was buying one! You made my day!) 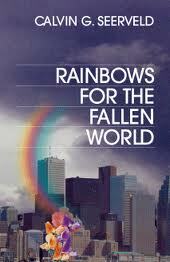 Rainbows for a Fallen World is a true personal favorite by an extraordinary scholar and powerful, passionate writer. Bigger on the Inside: Christianity and Doctor Who edited by Ned Bustard & Greg Thornbury (Square Halo Books) $17.99 Well, why not? There are geeky sci-fi fans everywhere, but these smart essays are exceptionally well suited to feisty young adults, those who like the famous show, or just those who want to see solid theological reflections growing out of an iconic piece of popular culture. CCO’s own Ivan Strong Moore has a blurb on the inside of this great paperback. One person said she wished I had a “My Other Vehicle is a Tardus” bumper sticker. So, yeah, there’s that. By the way, we had most of the core titles of the Square Halo Books backlist, too, per usual: It Was Good: Making Art to the Glory of God, It Was Good: Making Music to the Glory of God, Objects of Grace, C.S. Lewis and the Arts, Intruding Upon the Timeless, Rouault-Fujimura Soliloquies, etcetera. So good! Spiritual Friendship: Finding Love in the Church as a Celibate Gay Christian Wesley Hill (Brazos) $14.99 Some in CCO circles know Hill as he has occasionally spoken to campus fellowship groups out near and around Pittsburgh, and many have read his important and beautiful little book Washed and Waiting: Reflections on Christian Faithfulness and Homosexuality. I took all three of his books to the CCO staff gig, as I always do. (His other one is on Paul and the Trinity, and we sold one of those, too!) 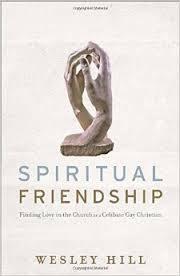 I hope you read my lengthy review of Spiritual Friendship at BookNotes a while back as it is truly moving book, insisting that a Christian view of things must include a deeper awareness of and commitment to the art of friendship. This is more important than any other book I can imagine on the topic, including (dare I say it?) The Four Loves by C.S. Lewis. It is vital for all of us, but certainly urgent for young adults who are still forging their life-long friends. Thanks, Wes, for this generous and profound study. 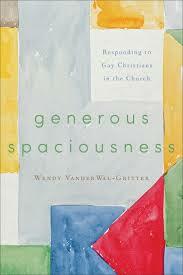 Generous Spaciousness: Responding to Gay Christians in the Church Wendy VanderWal-Gritter (Brazos) $16.99 I have reviewed this big book elsewhere, and in the serious desire to help organizations develop a mature theology of dialogue and respectful discussion on this (and other) topics, I bring this along, careful to encourage people to consider it carefully, inviting, as it does, gracious, open-minded discourse around how best to pastorally discuss our differences about sexual ethics. VanderWal-Gritter used to work for the now-defunct Exodus. Their founder, by the way, just released his own biography, including some never-before-told aspects of his life and ministry called My Exodus: From Fear to Grace; and it looks very moving (it includes a few chapters by his wife) but I have not yet read any of it. 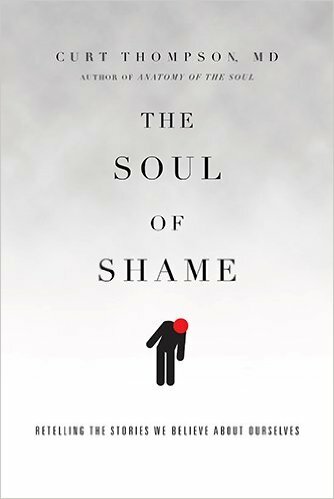 The Soul of Shame: Retelling the Stories We Believe About Ourselves Curt Thompson, MD (IVP) $22.00 You may recall that I wrote a lengthy rave review of this when it came out this summer. Curt has spoken at the CCO’s Jubilee conference and a few staff recalled that this was in the works and we’re eager to pick it up. It was great to show it off at their staff training – we find that it is selling nicely wherever we go, and its invitation to think about all of this is resonating widely. (Perhaps it is offering more deeply Biblical insights into some of the same concerned given lively voice by Brene Brown in her popular books such as Daring Greatly and Rising Strong. Thompson’s Soul of Shame is doubtlessly one of the important books of the year, very, very helpful. We also displayed and sold out of his previous book, The Anatomy of a Soul: Surprising Connections Between Neuroscience and Spiritual Practices That Can Transform Your Life and Relationships. We’ve got ’em here, now! 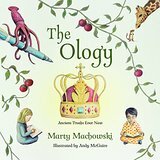 The Ology: Ancient Truths, Ever New Marty Machowski / illustrated by Andy McGuire (New Growth Press) $29.99 We usually take a few children’s illustrated books to the CCO, since many of their staff have young children, and we were eager to show of this brand new release. This is a really hefty volume, over-sized and full color on glossy paper and a ribbon marker, and it, too, was popular among CCO staff. The art here is soft (perhaps designed with chalk or wooden pencils) and yet still very, very creatively crafted — a few of the pictures are breathtaking in their loveliness, and a few are properly bizarre and striking. I do not know of any more comprehensive book about Christian truths for children, nor one with such a grace-based, gospel-centered faith perspective. Wow, this is going to be used for years to come, I am sure, and was delighted to unveil it at the CCO staff seminar. I thought you’d like to know of it, too. 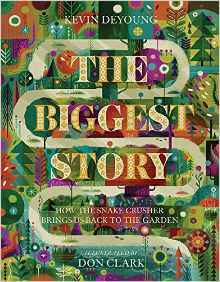 The Biggest Story: How the Snake Crusher Brings Us Back to the Garden Kevin DeYoung (Crossway) $17.99 Wow, this colorful, artful, creatively-produced children’s book was the talk of the event. 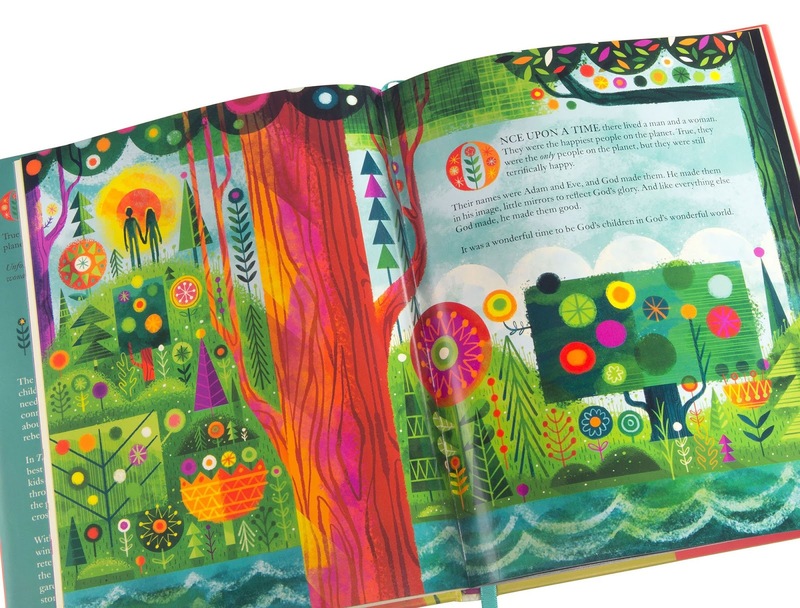 The almost eccentric combo of retro design and upbeat, new art styles, and the great, enticing re-telling of the whole Bible story — think of the Sally Lloyd-Jones must-have The Jesus Storybook Bible on steroids, visually high-energy and more wordy — makes this a stunning kid’s Bible storybook Bible unlike any you’ve ever seen. It is sometime eloquent and sometimes very colloquial, making it majestic at moments and then very down to Earth. That some classic theologians have suggested that the whole Bible is a footnote to God’s promise in Genesis three to crush the head of evil becomes evident here, and the “back to the garden”/Paradise Regained trajectory is beautiful to see made explicit in a children’s Bible. CCO staff (many who have young children) have been big fans of The Jesus Storybook Bible and the equally fabulous Thoughts to Make Your Heart Sing as well as other children’s resources that bring to the fore the covenantal reading of a Christ-centered vision of creation-regained sort of faith. That this was our biggest seller this past week is pretty cool. We wanted to be sure you knew our enthusiasm for it, and that you, too, could order it from us at the BookNotes 20% off.